Inflammable thread time~ <3 No, just kidding, my idea was not to spark political debate (heaven forbid) but to link to a site I've visited a few times since I found it years and years ago. As I pointed out, the idea is not to provoke political bickering, but I was simply interested in how others here positioned on the libertarian-authoritarian and the traditional "left-right" scales. No hating allowed here! Anyone interested, take the test and post toast of the resulting graph. x) I'm not implying the test is 100% accurate or that we should form strong opinions on anyone located differently than ourselves, it's mostly for fun and my love for graphs and stats that made me post this. Honestly. ._. Legend: Kri(zonar), Sim(onorged), Ste(wartsage), Lea(f), Ale(x S), Alf(onso), Bel(la), Nej(inOniwa), Pen(ti-chan), Coc(kleshell), Cho(cofreak13), (Pip)Pit(kin), Raf(faele the Amigan). The user whose name is hidden under Nejin's blob is Raf. The three blobs in the bottom left of the cloud are Coc (topmost), Cho (leftmost) and Pit. The blob between the three-blob group and Nej is Pen. I remember taking this in high school Government. 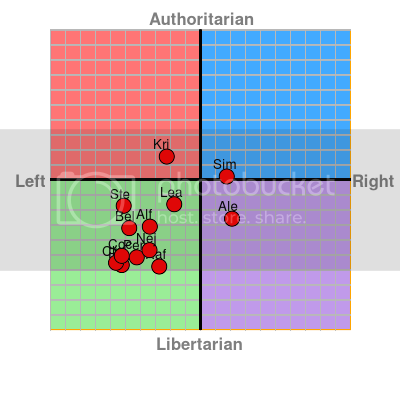 I refuse to believe I've become any less authoritarian (last time I was nearer the pope on the authoritarian axis) or socially liberal; probably just more ambivalent to the questions. Also: Okie from Muskogee is satire in the vein of, say, Uneasy Rider. No matter how Merle Haggard may have apparently changed politically in recent memory. Annnnd there are still no American political parties for me (according to the chart). Well, yeah. Kinda knew this one. I've taken this a few times before, and I'm pretty much exactly the same as you Stew. 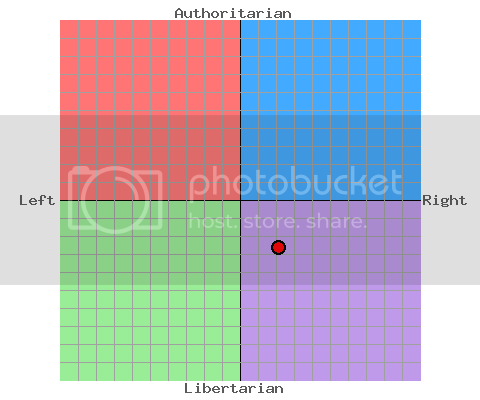 I'm waaaay more authoritarian and liberal then that though. I think. Slightly Authoritarian and almost in the middle, yes, that describes me well, really. @Choco: Somewhat. Not everyone has posted yet... I think. Pitkin, Bella, stuart, Choco, Nejin, new guy mac enthusiast; we're missing Aurora. It's really a combination of apathy towards others and dislike/distrust towards authority. Which add up to 'Leave me alone, I want to game/read/etc." Actually, most of us are more on the libertarian side, if that has any importance. and yes, Aurora should have some funs.